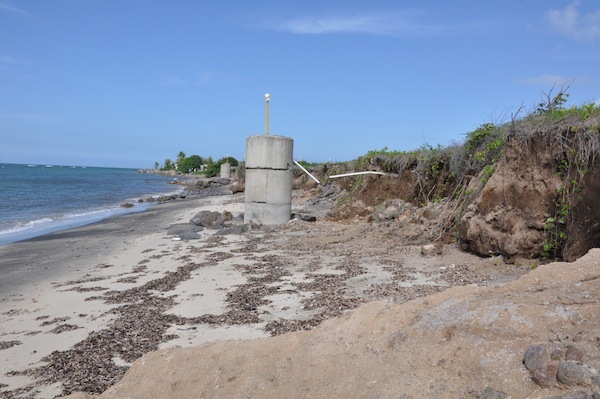 CHARLESTOWN, Nevis, May 19 2013 (IPS) - The Caribbean does not have the luxury of time for decisive action on climate change and global warming. In fact, it is on the brink of calamity, according to a prominent scientist. Conrad Douglas, a Jamaican scientist who has published over 350 reports on environmental management and related matters, has warned that “urgent action at all levels [is] required now”, cautioning the region against complacency in dealing with climate change. Noting that earlier models forecast that an atmosphere of 350 parts per million (PPM) of carbon dioxide would place the planet at a catastrophic tipping point for climate change, Douglas cited new information which put the new tipping point at 450 PPM. “There are 445 million PPM of carbon dioxide, which is a mere five PPM of carbon dioxide away from the…limit that was projected for catastrophic global tipping points,” he told IPS. With the projected loading rate at 2.5 PPM per year, Douglas said that within two years, the earth would reach a point where even more catastrophic events would wreak havoc on the planet, its societies and its economies. Last year was the warmest in recent history, including the highest temperatures since temperatures began to be recorded in 1895. "We are heading towards a dangerous place on planet Earth." “We know about Hurricane Sandy…and the destruction which it caused in our region and the eastern seaboard of the United States,” Douglas said, noting that parts of the United States and the Caribbean are still recovering from that storm. Douglas’ colleague, John Crowley, said that the planet’s nitrogen cycle had been severely thrown out of balance because of the massive overuse of inorganic fertilisers. “That, according to the specialists, is having catastrophic and potentially irreversible consequences that require a major rethink of agricultural systems, including but not limited to fertiliser use,” he told IPS. Both scientists are among dozens who gathered here from May 15 to 16 for a UNESCO-sponsored sub-regional meeting on environmental policy formulation and planning in the Caribbean region. “It was clear already in 2011 when we [first took stock of] these issues that the knowledge about climate change in the Caribbean is insufficient and insufficiently connected to the real dynamics of Caribbean societies,” said Crowley, a UNESCO representative. In 2009, a group of Jamaican artists launched a national public education campaign on climate change. It was part of a project implemented by Panos Caribbean, a regional organisation that helps journalists cover sustainable development issues, and Jamaica’s National Environment Education Committee (NEEC). The artists produced a package of information designed to educate the Jamaican public. It consisted of a theme song titled “Global Warning”, a series of public service announcements, a mini album of songs on climate change, and a music video for the theme song. Even as deliberations continue here today, the general assembly of the United Nations in New York is meeting on sustainable development and climate change. “I think we have finally awakened to the urgency of the situation, that we have tested and exceeded the globe’s capacity for absorbing and assimilating the pollutants that we make and discharge,” Douglas said. Marcus Natta, senior project analyst in the Ministry of Sustainable Development in St. Kitts, told IPS the meeting was very timely. “What is important about this particular conference is that we are focused on action. I think unlike many other meetings, if we could truly achieve the action part after the planning and get the implementation, then we would have really achieved success,” he said. The tiny island of Nevis is described as one of the few remaining unspoiled touches of paradise and one of the little-known wonders of the Caribbean. Douglas hoped that actions taken at the meeting would help preserve it as such. “We hope that in the context of what faces us today – the phenomenon of climate change – that its beauty and charm will be preserved long into the future as we take wise and timely action to protect the habitat of mankind and all living creatures,” he urged his colleagues. “This we must strive to do as we protect ourselves from ourselves. It’s our attitudes and values, our failure to change our behaviour that has led us to this critical point,” he warned, adding that the current path mankind is treading “threatens at the very least to plunge us into a perpetual cycle of poverty and misery”.